Tommy Lee Wallace not only created the iconic Michael Myers mask that would define a genre and redefine the word “Halloween” for horror fans, but he actually embodied The Shape (pictured below), portraying the iconic killer in several key scenes of John Carpenter’s 1978 masterpiece. His importance to the original Halloween cannot be understated, serving as far more than his credits of production designer and editor would even begin to suggest, and then he went on to write and direct perhaps the best of all the sequels with Halloween III. We caught up with Wallace at the epic Halloween reunion at Flashback Weekend last summer in Chicago, where we discussed the creation of a legend and the recent long overdue Season of the Witch ascension to acceptance among franchise fans and achieving its status as a classic in its own right. Read on for our full interview with Tommy Lee Wallace! In recent years there’s been a revitalized interest in Halloween III. What are your thoughts on that? “I think first off, the reaction in the beginning was extreme, because John and Debra and I, and Universal Studios, were just ridiculously naïve about what the public needed in order to go with our (anthology) concept. The public needed a real advertising campaign that said ‘Hey kids, this year it’s going to be different, we’re going to try something here and we hope you’ll roll with it’. But there was nothing like that, no advertising of that sort, and that was just foolish. So it took a lot to recover from the backlash of that. That’s one thing. “But in the movie’s favor – not to brag too much – but it’s a damn good movie. So, because it’s seasonal and it just keeps popping up year after year, it finally just broke through to people, had enough fans saying ‘Hey this is a good movie’, that it’s just ultimately prevailed. And I think that’s just a logical process. It hit a critical mass. “Fans used to come up and defend it and say ‘I love it, I don’t care what anybody says’, and I really appreciated that, but these days I just tell them, ‘Hey, you don’t have to do that anymore, because it found its audience’. It’s extremely gratifying. Then Scream Factory did that great 30th Anniversary Blu-ray release a few years ago. Do you think that helped bring even more positive attention to the film? “That did not hurt a bit. The beautiful artwork, nice package presentation, and when people give it a chance on its own terms – if they can forget the Halloween III part of the title – then most people like it. Most people are in favor of it. That was your first directing job, right? Were there challenges that you didn’t see coming, with it being your film this time? “Quite the opposite, I experienced the best support a first time director could ask for. Usually you’ve got nervous people standing around trying to make sure you don’t screw up and wondering what to do if you do screw up. John knew that I was ready. He knew that I knew the kind of style that we were operating in, so he had confidence in me. “He basically just turned the stage over to me and stayed out of the way, which is what he demanded on his pictures. For him to entrust me with that same way of doing things was just incredible, but that’s what it was. He and Debra were there in total support. “I had a crew of people I had worked with and was friends with, headed up by (director of photography) Dean Cundey, who even then was one of the world’s great cinematographers, and he went on to prove that. So I had it really good. Do you think that was because Carpenter was given such freedom? “Well he wasn’t given it, really. You’d have to say he insisted on it. Basically he made deals and worked so cheap, with budgets so low, that those were the conditions of the deal. ‘Hey I’ll do this for you for your stupid dollar ninety-eight, but I get total control and I get final cut. It was a brilliant move. It actually probably was harder on him later when he tried a couple of movies that he didn’t have that and found that the surf was a great deal choppier. Going back to working on the original Halloween, you did so much on that movie, but what was the most challenging thing? “Getting sleep. First off, I didn’t really know what a production designer did, other than design the show. I was out of art school, so that covered everything. I was doing cars, I was helping Nancy (Loomis) with costumes, props. On an everyday basis, it was a three-man art department, with Nancy, who was in front of the camera a lot the time, taking care of costumes, and us being in support of her. That means the four of us were doing about 12 jobs. “I was finding locations. I didn’t know there was supposed to be such a thing as a location manager. It went on and on like that, you know, making signs, because I came out of graphic design, doing the graphics for the show, everything. The transformation of the Michael Myers mask (from an original Star Trek William Shatner mask) has become so iconic now. Did you have any idea that this would carry on the way it has and become as iconic as Dracula and Frankenstein? “I don’t see how any of us could have seen that coming. I did know two things. When the movie was finished and we got done with the sound mix and we had done all of the things in the lab to make the picture the way you want it to look, I know we had just a damn good movie. I couldn’t have dreamed of what happened. “The other thing was the making of the mask. All I knew was that it was pretty interesting looking. The time I got the glimmer was in pre-production and we tried out another mask, an Emmitt Kelly mask, and then the Shatner mask. The Emmitt Kelly mask created a kind of a sensation. It looked cool and it would have worked in its own perverted way. “But when the guy came out and modeled The Shape mask, it just took our breath away it was so scary looking. 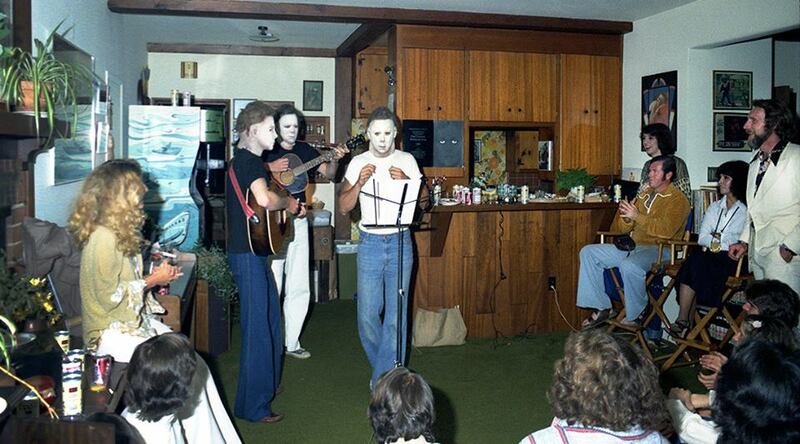 There’s a photo in Kim Gottlieb-Walker’s book (On Set With John Carpenter) of you and Nick and John, I think at the after party, playing guitars and you’re all three wearing a Michael Myers mask. I was just wondering about that, because we were always led to believe that there was just the one mask in the original and then they used that one in the second movie. Do you remember if that was at the wrap of Part I or Part II? “That was at the wrap of Part I, and I would have made at that point – might have been three, might have been four, might have even been five (Myers masks). Ok, I was just wondering about that, because it’s such a great picture and I had never seen it until that book came out. It’s just such a great image and it shows that you guys were having fun. Read more Halloween interviews here! Conventions	Halloween Daily Goes To Mad Monster Party 2016!